You aren’t fit to lead if your greatest strength is seeing weakness. Smart talented leaders find it easy to point out inadequacies, describe what’s wrong, and explain disagreements. There’s no creativity in pointing out weakness. There’s no imagination in disagreement. There’s no innovation in explaining what can’t be done. There’s no added value in tearing someone down. Ineffective leaders find fault like it’s the only thing leaders do. You should be better at…. The ability to see wrong, point out weakness, highlight mistakes, and declare deficiencies is important and necessary. But don’ts, won’ts, and can’ts stabilize the past. Warning: It’s safe and powerful for leaders with authority to prevent change, end exploration, and tell people what they can’t do. Have you thought about…? Offer alternatives when you disagree. What if… ? How about… ? Have the courage to make something better, rather than simply pointing out inadequacy. You’re great at … . How can you bring your strengths to this challenge? The future depends on the strengths of the people around the table. How might we make this better? The pursuit of excellence is a pursuit. In other words, you always fall short. Develop imperfect solutions. 80% is good enough for most things. Notice three strengths for every weakness you point out. Say what you see when you see progress. Leverage positive energy. Figure out how to apply energy to positive outcomes. How might leaders overcome the tendency to see weakness and point out fault? Thank you, Dan. In what seems like an increasingly negative world, we need more leaders that can ask the big “what if” questions. We need more leaders that can inspire and help their people connect to purpose. So much good stuff here for me in my roles as teacher and pastor, not to mention husband and father. Thank you! Encouragement is so key in helping others. It’s easy to point out bad grammar or poor writing. It is harder to commend well done work. I wonder why that is the case. Thanks Pete. I wonder why we don’t take a “make it better” approach. How could we make this paragraph better? What are you trying to say? What’s most important to you? How can you write that? There is is huge difference between leaders who see the donut, and those who only focus on the hole! Nice quality information in this post. the philosophy of not tearing someone down and building to their idea is great leadership 101. This article is a great reminder of how leaders should act. I so appreciate your blog. You distill dynamic truth in an easy to digest format. And 300 words is PERFECT. I am able to pass it along to others that normally wouldn’t take time to read it. Thank you! It is the one blog I look forward to seeing in my inbox daily. So true Dan, we focus so much on “negative”, we have deleted the “positive”. 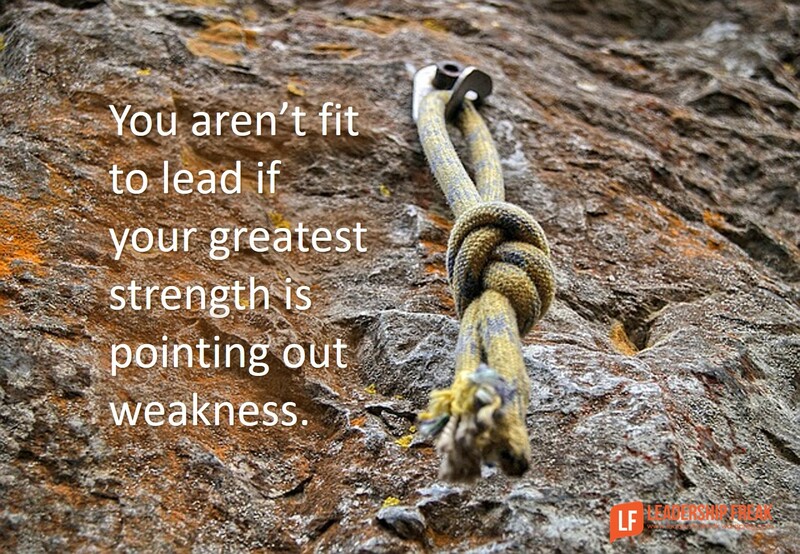 We as leaders need to turn weaknesses into strengths, nurture them into leaders themselves. Without coaching, teaching we all fail. Whenever in doubt, ask questions. Great post. I agree that it is ineffective to continuously point out the negatives. Constructive criticism is key but letting someone know the positives they are doing and how to improve is key. If an employee knows that their leader is always finding fault in their work, then at some point they will stop trying. This is an excellent article, and I think it will be useful for many of us at my workplace (and in our personal lives). Thank you for giving us clear and succinct ideas about how to re-phrase negativity into something that brings positive thought and change! Thanks Dan. I love the tip to say 3 positive things before pointing out the negative. Its practical, understandable, and effective. Such a great habit to challenge ourselves with. People are so much more receptive once they drop their default defenses. It like plowing the field before planting the seeds. Dan, I have a manager who, when approached with a good idea, consistently replies with, “I don’t disagree. The way I see it is…” and then condescendingly ‘mansplains’ and manipulates the conversation so that it sounds like he came up with it, instead of the talented folks who brought forth the idea (especially when the idea comes from female leaders). How do we break him from this very negative behavior. It’s gotten to the point where my peers and I don’t want to share their ideas/expertise because he’ll just turn it into a “30 minutes about himself” moment. It makes all of us feel as though he doesn’t value our talent or time. Good evening Dan. The “can’t do that attitude” is strong and thriving. I tell my team members that while there may be a hundred reasons “why not,” I only need one reason “why yes!” Great article. “Negativity” as word is thrown around way too carelessly and too frequently used to label people and be dismissive of them. It also way too subjectively used. Everyone has a paradigm, and sometimes we can change or challenge that paradigm. Everything is relative. To an ‘optimist’ a ‘realist’ is a ‘pessimist’ and to a ‘pessimist’ a ‘realist’ is an ‘optimist’. I try to avoid labeling people, which is a form of judgement. I make it a point to try not to judge people but instead try to understand their paradigm so I can change it. Simple rules we overlook sometimes. Communication is king, even with best intentions of being positive and trying to lead teams to the right outcome, one missed place sentence can unravel everything. Know you audience, learn what makes them respond well and then work together to solve problems. -Leaders don’t conform to the consensus. They create consensus to their vision and goals. -Leaders don’t change their positions mid debate. The welcome scorn from the masses because it creates the opportunity for dialogue. -Leaders don’t look backwards to condemn what has already been done, they look forward to create a better future. -Leaders are not dogmatic. They are principled and know that change is never easy, but when it’s necessary, they must lead. To follow up on my earlier comment, when we label people/put them in categories or “boxes”, we are putting up “walls” in a sense. I never found “building walls” helpful when dealing with people and building/eading successful teams. Sometimes what this article would call a “negative” person is a a born troubleshooter and just has the paradigm of zeroing in on what needs fixed. He lets others admire what isn’t broken while he out fixing the problem. So that “negativity” or “cynicism” (not my words) others see can be a great asset. So again, I don’t believe in labeling people with derogatory adjectives. Everyone has a contribution to make, and a true leader can harness whatever a person brings to the table, whatever their paradigm. Terrific article. We can all be guilty of this. From some book or speech I gained two thoughts that I do my best to practice. “Rather than focusing on catching an employee doing something wrong, focus on catching them doing something right and make it public”. “Reward, Recognize and Celebrate good behavior”. It picks everyone one up. Thanks for the powerful message. Truth! And yet there is no progress unless the greatest weakness holding back any organization is dealt with and corrected. Totally agree with you Dan. This world is full of leaders as well as other individuals who are quick to bring your hardwork down and criticize it coldly. Unfortunately what they don’t realise is that you already know that and you’re actually well aware of that and whatever you’re trying to achieve is actually a work in progress. Some leaders use their role to ridicule and brag about what they already know forgetting they too started somewhere.